Holiday desserts are always fun to bring to a party or make for friends and family for every day supper. 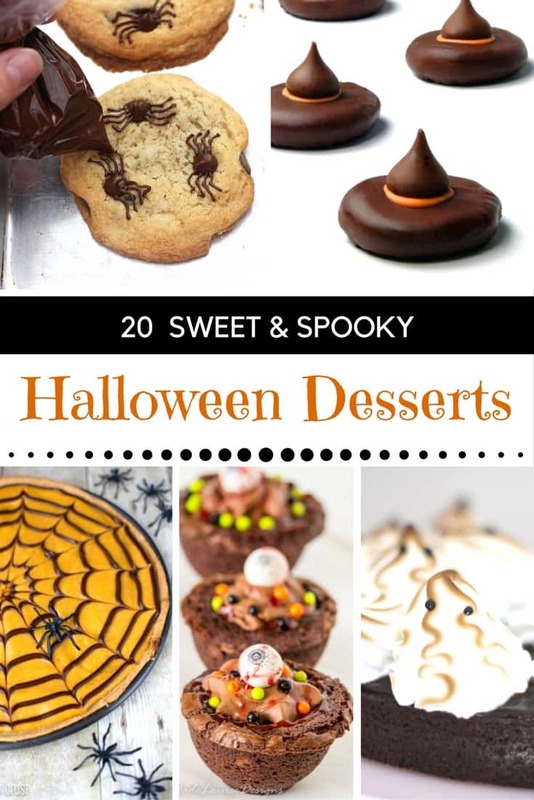 These 20 Halloween desserts are going to inspire you to throw your own Halloween Party! #1) CHOCOLATE CHIP SPIDER COOKIES – these cookies are super easy to make and really do look like spiders are crawling on your cookies! #2) WITCHES HATS – these cookies are easy to make and would be the perfect dessert for your child’s lunch box. #3) BROWNIE HALLOWEEN CUPCAKES – these 2-toned cupcakes are adorable and perfect for a party! #4) HOT COCOA GHOSTS – these marshmallow ghosts can top any dessert or Halloween drink. #5) SPIDER CUPCAKES – add a creepy crawly element to your party with these googly eye Halloween cupcakes! #6) PUMPKIN SPICE SPIDERWEB COOKIE PIZZA – need a quick, eye catching dessert for Halloween? Try this one. #7) LEAKY CAULDRON BROWNIES – these brownies are complete with an EYEBALL and inspired by Harry Potter. #8) GHOSTBUSTERS CANDY BAR TARTLETS – hunt these ghosts at your next party! #9) LEFTOVER HALLOWEEN CANDY SALTINE BARK – this is the perfect way to use up all that Halloween candy your kids come home with. 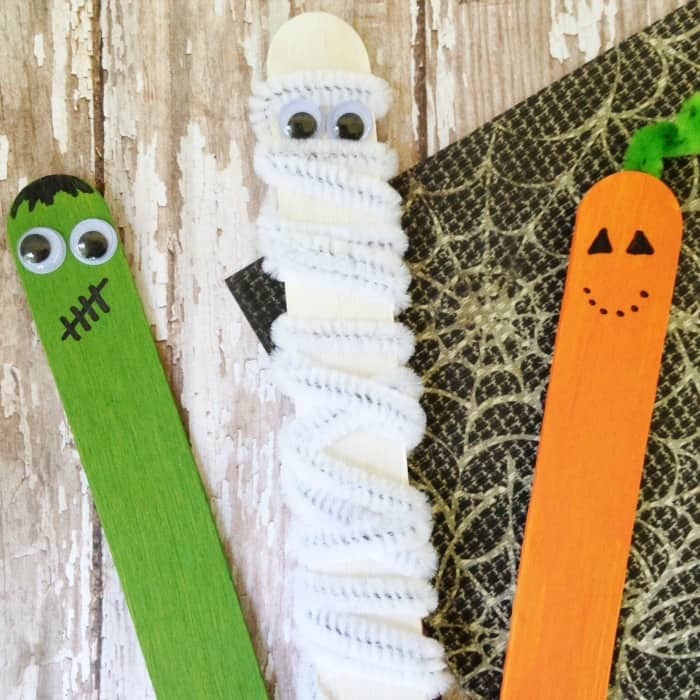 #10) CANDY COOKIE MONSTERS – who doesn’t love a little scare on Halloween? #11) COOKIES & CREAM OWL CUPCAKES – these h’OWL’oween cupcakes are adorable! #12) HOMEMADE CANDY CORN – make your own sugary treat with this homemade candy corn recipe. #13) ZOMBIE DIRT CUPS – don’t want the zombie aspect? Add gummy worms instead! #14) HALLOWEEN CANDY CHOCOLATE – make your own coffins, mummies and tombstones with this recipe. #15) BLOOD SPATTER COOKIES – need we say more? #16) WHITE CHOCOLATE GHOSTS & MUMMIES – simple to make and so delicious. #17) DAY OF THE DEAD COOKIES – these cookies are a colorful/playful take on skulls. #18) 4-INGREDIENT JACK O’LANTERN COOKIES – perfect for a school party, these cookies are vegan, grain free and gluten free. #19) RED VELVET MURDER CAKE – add a little gruesome to your party with this cake. #20) SPOOKY SPIDER RICE CAKES – these deliciously spooky spiders are the perfect fun and scary treat, and they’re really easy to make. WHAT HALLOWEEN TREATS DO YOU MAKE? The chocolate chip spider cookies would be the most fun to send to my son’s class Halloween party! I think the kids would really get a kick out of them! My oldest is a Halloween baby, so it’s fun baking and buying all kinds of Halloween themed treats for her birthday!! I’d love to make ALL of these, especially the PUMPKIN SPICE SPIDERWEB COOKIE PIZZA.